Obesity may be the biggest public health crisis facing the UK today. Levels have risen more than three fold since 1980. Being obese makes you vulnerable to a range of health risks. Being an overweight child makes it more likely you will become an obese adult. And you are much more likely to be an overweight child, if you come from a poor family. If current trends continue, half the population of Britain could be obese by 2050. Early intervention is the most effective way to break this cycle. And that requires a better understanding of why children become overweight. A new study by a team at the ESRC funded International Centre for Lifecourse Studies in Society and Health at UCL and LSE makes clear the scale of the problem and points to some crucial factors likely to lead less-well-off children to gain excess weight, as co-author Professor Yvonne Kelly explains. A link between poverty and childhood obesity has been found in many developed countries. Intuitively, it seems likely this link is the result of poorer parents not being able to afford healthier food, like fruit, or outings involving exercise for their children. It could also be that those parents know less about healthy lifestyles and that they themselves eat less healthily and exercise less. But intuition is an insufficient basis for the scale of intervention required. This study is the first attempt to examine and compare in detail why children in poorer families are more likely to be overweight. Our data comes from the Millennium Cohort Study (MCS). This tracks nearly 20,000 families from across the UK. We used measurements made when the children were aged 5 (when just entering primary school) and 11 (the point at which they leave primary school and are on the cusp of adolescence). We used standard definitions for ‘obese’ and ‘overweight’. The first thing we found was that the link between relative poverty and childhood obesity is stark. 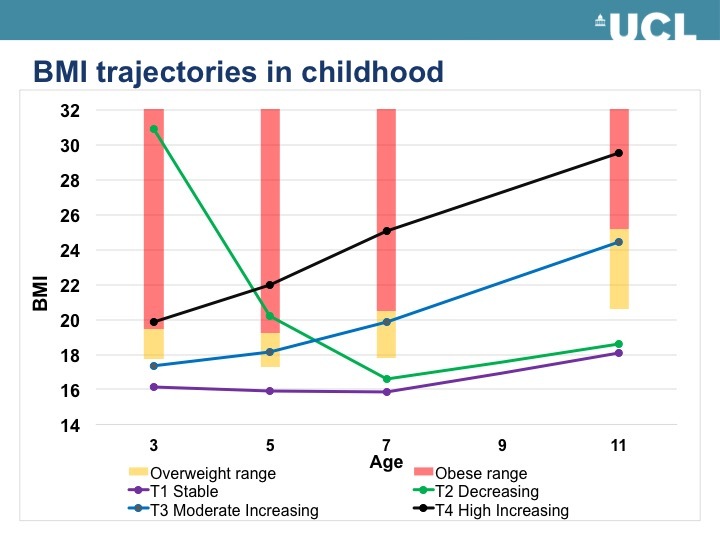 At age 5, poor children were almost twice as likely to be obese compared with their better off peers (6.6% of children from families in the poorest fifth of the sample were obese while the figure for the richest fifth is just 3.5%). By the age of 11, the gap has widened- nearly tripling (7.9% of the poorest fifth are obese; for the best-off, the figure is 2.9%). Given that obesity is linked to the development of numerous chronic diseases and that there is evidence overweight and obese children are less likely to grow into economically and socially successful adults, this is a significant burden to be borne by the children of the less-well-off. And unless we can weaken the link our chances of reversing the overall obesity trend are much reduced. The MCS collects a broad range of data, allowing us to dig beneath these headline numbers to identify some of the specific ways in which relative poverty in childhood leads to an increased risk of obesity. To measure the degree to which the mother followed a healthy life-style we looked at factors previously shown to be linked to the increased risk of obesity, such as whether the mother smoked during pregnancy, how long she breastfed for and whether the child was introduced to solid food before the age of four months. We could also factor in the degree to which the mother was herself overweight or obese. To assess the impact of physical behaviour, we compared the frequency of sport or exercise, active play with a parent, hours spent watching TV or playing on a computer, journeys by bike and the time that children went to bed. We compared dietary habits via data on whether the child skipped breakfast and on fruit and sweet drink consumption. What we found was that a lot of these factors were relevant. Maternal behaviour in early childhood was certainly important. Markers of ‘unhealthy’ lifestyle here could mean as much as a 20% additional risk of obesity for a child. Measures of physical activity and diet were also relevant at both 5 and 11 years of age, as were early bedtimes and fewer hours in front of the TV or games console. Skipping breakfast and eating more fruit were factors at 5 but less significant at 11. Doing sport more frequently played a more important and protective role at age 11 than at age 5. Further examination of the differences between the children aged 5 and aged 11 revealed that poorer children aged 5 were much more likely to gain excess weight up to age 11 than richer children. The earlier certain lifestyle factors can be challenged, therefore, the greater the chance of positive impact. Assuming that income inequality is not going to disappear, we can only tackle ‘inherited’ obesity via the lifestyle choices that tend to go with lower incomes. Early intervention with mothers clearly has huge potential. And evidence from our work suggests that this should start before birth or even conception. It is clear, too, that campaigns to encourage family physical activity and healthier diets would help. The Government is already trying to persuade families to eat more healthily and take more exercise. But these efforts are widely targeted and their effectiveness only broadly assessed. Our analysis has already suggested better targeting. More research should be undertaken to narrow the aim and increase effectiveness still further. Why are poorer children at higher risk of obesity and overweight? A UK cohort study is research by Alice Goisis, Amanda Sacker and Yvonne Kelly and is published in the European Journal of Public Health. This entry was posted in Research and tagged Adolescent, Bedtimes, Breastfeeding, Children's Health, Diet, Health, Inequality, Maternal health, Millennium Cohort Study, Nutrition, Obesity, Overweight, Physical Activity, Play, Poverty, Pregnancy, Public Health, Smoking, Sugar, Teenager on December 11, 2015 by Christine Garrington. Helping more mothers breastfeed is a policy goal shared by many governments. Advocates argue that breastfeeding has a positive impact on a child’s physical, cognitive and behavioural development. Because of overlaps with other factors such as a mother’s social class or education, it is hard to measure precisely the degree to which breastfeeding alone benefits a child, but most policy-makers accept there is a benefit and want to know how to encourage more mothers to start it and stick with it. The incidence of breastfeeding varies significantly between women with different ethnic backgrounds and in different ways in the UK and US. Professor Yvonne Kelly from the ESRC International Centre for Lifecourse Studies at UCL asks if there are clues here as to how best to encourage women from different backgrounds to breastfeed their children. The UK has one of the lowest breastfeeding rates in the world, although according to the NHS Infant Feeding Survey of 2010, the proportion of babies breastfed at birth is 81%, up from 76% in 2005. At three months, the proportion of mothers breastfeeding exclusively is 17%. At six months, the figure is just 1% and that has not changed since 2005. The same survey found that breastfeeding was most common among mothers who were: aged 30 or over, from minority ethnic groups, left education aged over 18, in managerial and professional occupations and living in the least deprived areas. The fact that younger, less educated, less well-off women are less likely to breastfeed is not surprising. Indeed, encouraging breastfeeding is at least partly about reducing inherited disadvantage. What may be less obvious (to the majority population, at least) is that ethnicity appears also to be a significant factor. When we looked at the data in the Millennium Cohort Study, which has been tracking the lives of some 20,000 children born at that time, we saw that well over 90% of Black African and Black Caribbean mothers at least started breast feeding. The figure was over 85% for Indian and Bangladeshi mothers, 75% for Pakistani mothers and 67% for white mothers. Even after adjusting for demographic, economic and psychosocial factors, the difference remains significant. At three months, with a range of factors considered, Black African mothers are more than 5 times more likely than white mothers to have started and continued to breastfeed. Clearly, if we understood why Black mothers were more likely to breast feed than white mothers we might have a better understanding of how to encourage all mothers to breast feed. An important part of our efforts to gain a clearer picture was to look for similar patterns in similar countries. So we did a comparison with the United States, where the overall rates for breastfeeding are very similar to the UK, as are the links between breastfeeding and socioeconomic status. Not at all similar, however, are the links between ethnicity and breastfeeding. In the US, the highest rate, according to the National Immunization Survey in 2002, was among Hispanic mothers, at 80%. 72% of white mothers initiated breastfeeding. Only 51% of non-Hispanic black mothers did. So, in the UK black mothers are the most likely to breastfeed. In the US, they are the least likely. Why the difference, given that usually, health problems suffered disproportionately by black Caribbean people in the UK affect black Americans similarly. Is there a mistake somewhere? We consider the possibility of recall bias in light of the fact that data were collected when the children were 9 months old. It does seem reasonable to suspect mothers might want to believe they did more breastfeeding than was actually the case. But there is no obvious reason why that bias should apply differently in the UK and US. As the study suggests, the contrasting findings in the UK and US raise important wider questions about the nature of ethnic disadvantage. One possible answer is that differences in breastfeeding reflect strength of cultural tradition and degree of “integration”. This, of course, can vary for similar ethnic groups in different “host” communities. The important thing is not the ethnic group itself, but the relationship between it and the rest of society. Our study found that those who spoke only English at home were less likely to breastfeed. That raises the concern that as incoming groups adopt dominant cultural practices, their tendency to breastfeed will reduce. Cultural factors certainly merit further investigation, given that the only thing we considered in this study was whether English was the main language spoken at home. Black people in the UK and black people in the US have different histories and, therefore, different identities. There are differences, too, in their “host” communities. In this instance, the very different health systems could be particularly relevant. Maybe future research should concentrate on this relationship rather than the behaviour of groups defined by characteristics that appear to have only secondary significance. Those responsible for developing and implementing policies aimed at increasing breastfeeding rates in this area would certainly be advised to pay close attention to the different social, economic and cultural profiles of all ethnic groups. Racial/ethnic differences in breastfeeding initiation and continuation in the United kingdom and comparison with findings in the United States is research by Yvonne Kelly, Richard Watt and James Nazroo and is published in Pediatrics, Official Journal of the American Academy of Pediatrics.. This entry was posted in Research and tagged Babies, Birth, Breastfeeding, Children's Health, Health, Inequality, Infant feeding, Maternity, Millennium Cohort Study on April 16, 2015 by Christine Garrington. Breastfeeding – to a schedule or on demand? Mums-to-be are frequently advised in baby books that feeding to a schedule is best for their child. But what does the evidence tell us when it comes to the different approaches and what might that mean for parents, practitioners and policy makers? Dr Maria Iacovou from the University of Cambridge presents recent evidence breastfeeding research at an ESRC Centre for Lifecourse Studies Policy Seminar. Breastfeeding and intergenerational social mobility, what are the mechanisms? A propensity score matching analysis of two population based cohort studies, Archives of Disease in Childhood, 2013. Infant feeding: the effects of scheduled vs. on-demand feeding on mothers’ wellbeing and children’s cognitive development, European Journal of Public Health, 2013, 23(1) pp 13-19. The Effect of Breastfeeding on Children’s Cognitive and Non-cognitive Abilities, Labour Economics 19, 2012. The effects of breastfeeding on children, mothers and employers, Research project information, Institute for Social and Economic Research, University of Essex. This entry was posted in Research and tagged Babies, Baby books, Bedtimes, Behaviour, Birth, Breastfeeding, Children, Children's Health, Health, Inequality, Infant feeding, Maternity, Obesity, Pregnancy, Socio-emotional difficulties on February 5, 2015 by Christine Garrington.